The CCM-202 receives downstream data via cable and sends upstream data through a telephone line at 14.4Kbps. The cable modem contains a DHCP server that assigns the proper ip, gateway ip, and nameserver information to the first computer that requests it. The modem's ip information is updated by isp when the modem is first powered on. Each modem is assigned 2 ip numbers. One for the upstream and one for downstream. Uplink at 14.4Kbps is painfully slow. Playing network games over a one way cable modem can often be a slower than utilizing a conventional dial up ISP. 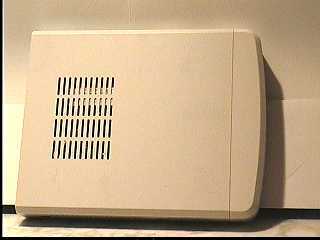 With a little clever snooping around, you may be able to find out the number which your cable modem dials out to. I found my number by picking up an extension telephone line in my house (also used by the cable modem) and recorded the DTMF tones into a sound file, then used dtmf.exe to decode them. Dialing that number with my US Robotics modem, I discovered that the modems on RCN's end are able to support rates as high as 33.6 Kbps. By performing a simple modification you can modify your Hybrid CCM-202 cable modem to utilize a faster external modem thus increasing your uplink bandwidth 2 - 4 times! 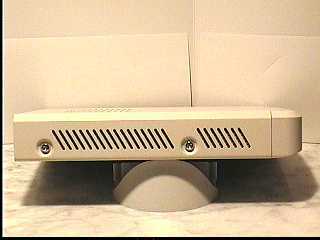 Top view of the modem is shown to the right. To remove the case, unscrew the 4 screws on each side of the modem. Unscrew the 2 screws in the back plate and also the nut that secures the coax jack. The cover can then be slightly bent and lifted off the unit. To the left is a picture of the guts. The modem consists of 2 circuit boards. 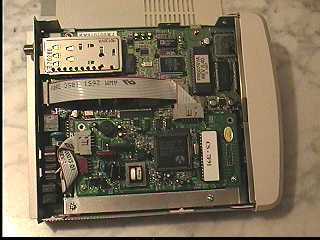 The smaller board (telephone modem) is shown on the bottom half. 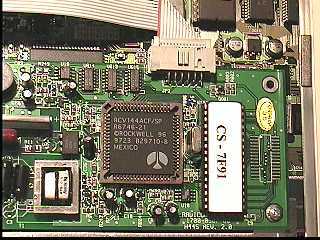 The main board contains a variety of IC's from various manufacturers and is located under the modem board. 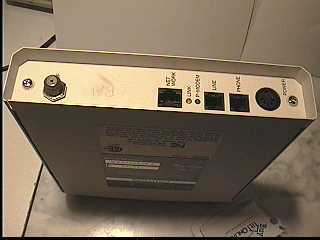 We can clearly see the cheap piece-of-crap Rockwell 14.4 modem chipset used here. Could there possibly be a way to increase our pathetic uplink bandwidth ?? SURELY ENOUGH there is something we can do.